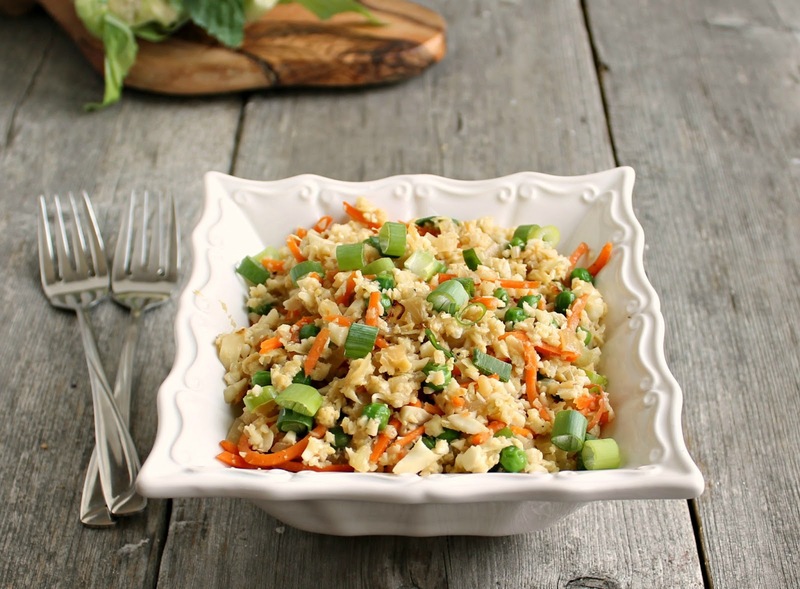 Hungry Couple: Cauliflower "Fried Rice"
Cauliflower masquerading as rice? What? Huh? Having recently turned cauliflower into an amazing "cream" sauce, I've come to the conclusion that it must be the most versatile veggie on the planet. Still, when I saw this recipe on Family Fresh Meals, I worried that the cauliflower would soften too much and turn into a paste. But I just had to try it because it was much too fascinating to pass up. Can I just tell you...wow! This is so good and so, so good for you. Brian and I have been happily shoveling in bowls of this stuff, although he prefers his with some chicken or shrimp. I'm just happy to have a giant bowl of tasty fried rice, sans rice. All the great taste with none of those empty carbs. And even though this recipe technically serves two, I've been known to put away the whole thing when I'm by myself. Enjoy! To grate the cauliflower, place about 5 - 6 florets into the bowl of a food processor and pulse about 25 times. The cauliflower will have a rice-like consistency. Set aside. Add the olive oil to a large pan and saute the onion and garlic on medium heat until soft and translucent. Add the carrots and peas and continue cooking on medium heat for another couple of minutes. Add the soy sauce, raise the heat to high and add the cauliflower. Saute for a couple of minutes until the cauliflower is heated through. Make a well in the center of the pan and crack in the egg. Whisk until the egg scrambles and distribute it throughout the mixture. Season with salt and pepper, top with the scallions and serve hot. Makes approximately 2 servings. I love using cauliflower as a stand in for rice! The fried rice sounds amazing, with shrimp would be outstanding. 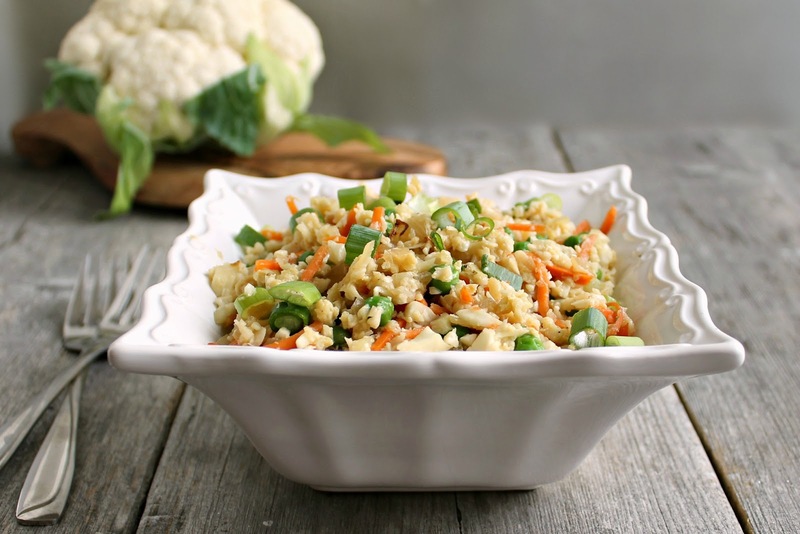 I'm about to try another cauliflower recipe, and now I can't resist this one! It's like..my new thing. Ooh..I need to try this. It looks and sounds delicious! This is so great! I have been wanting to try the whole swap cauliflower for rice thing for so long. I must try it! yummy, this rice looks amazing! Oh, it looks so yummy. I'm gonna cook that as soon as I can get myself a cauliflower head! That sounds really great! 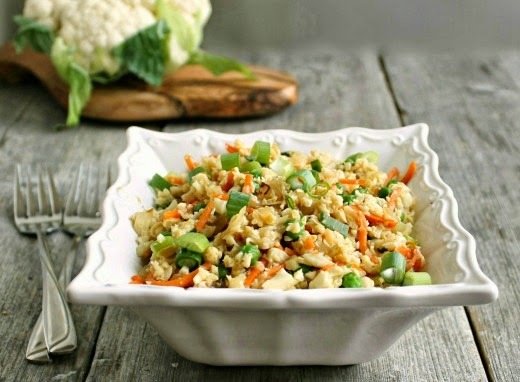 I love them both so I must try cauliflower as rice! This looks so good and sounds so healthy! Cauliflower is really an amazing vegetable. I would never have thought to make 'rice' using cauliflower but this sounds so delicious I must give it a try. Thanks so much for sharing this on Foodie Friends Friday. Well, I finally tried it and you are not kidding! Wow! So good. Have tried mashed cauliflower, but not cauliflower rice. Will have to add it to my repertoire! I have no idea how I missed this recipe when you first posted it, but this is going on my menu for January. It sounds fantastic and I love the bowl it's shown in, too! I'd love to know who makes it/what the pattern is called, please. Hi Alison - I picked up the bowl for $3 on a clearance rack at Marshall's but the bottom markings say Ceriat, S.A. Portugal. I did a quick search and they have a web site plus I saw bowls like that for sale on eBay. Hope that helps! How many calories are we looking at? I am not a nutritionist but my best calculation is less than 150 calories per serving. I think you should be able to take it to a gathering but it does taste best when it's warm. If you have the ability to heat it in the microwave for a few seconds when you arrive, that would be best. Thank you soo much, i will defaintly try. I LOVE this! I was hesitant about it at first.. even up until I put the egg in. But once I put the egg in and whisked it, it turned into exactly what I was hoping for. I don't even think I'd prefer rice over cauliflower in this case! SO good. I must say I will make this again. Mine wasn't as pretty as the picture but tasted great. I'll work on presentation next time. I added a couple dashes of sesame oil and fish sauce, just to get that authentic Asian Restaurant Fried Rice flavor. WOW! I'll never cook traditional fried rice @ home ever again! Any idea about the dark count? Hi Vicki - I'm afraid I don't understand your question. What is a dark count? Where is you print prompt so you can print this or any other recipe on your site? can you use frozen peas? I can't believe this receipe...this is exactly what I have been craving! I will be eating this today! Sorry to disappoint, but we really didn't like this. It was very bland with just soy sauce so, as another reviewer suggested, added fish sauce and sesame oil. I also added some chicken stock powder and a little extra soy sauce. I don't know whether it was the texture and flavour or just one of them but probably wouldn't make this again. Glad that I tried it anyway and I did like the fact of it being healthy. For other reviewers, this is just my opinion.